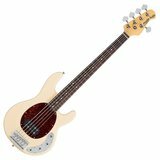 The Sterling Ray34 Bass features a lightweight slab body crafted from solid ash wood, delivering a sweet, twanging tones that’s both resonant and has an excellent sustain. The bright body wood offers a slightly scooped midrange with firm lows and pleasant highs. The bass’ Sterling by Music Man designed bridge is based on the bridge used for the StringRay, providing incredible string stability with the option to adjust the saddles to find the perfect intonation. The Maple neck gives the bass’ tone bright characteristics, helping to tighten up its sound whilst providing plenty of cut. The rosewood fingerboard adds warmth to the overall tonality ehilst helping to ‘fur up’ the maples natural tone. The maple and rosewood work together to delvier sizzling highs that sparkle, thick, firm lows, and an open midrange attack. The 2-band active EQ allows for more control over the dynamics of the bass's tone with the two EQ control pots. With the standard volume control, the EQ is configured with controls for the treble, and bass to allow for tonal adjustments that will suit your playing style and to ensure that you have a fantastic tone before the sound even reaches your amplifier.